Anokhi is a brand more commonly associated with the sale of specialist products such as appliqué, embroidery, patchwork and bead work, made by traditional craftspeople in and around the Indian city of Jaipur. Established in the early 1970s by Faith Singh and J.P. `John’ Singh, it was discovered that many of Anokhi’s customers were keen to get behind the scenes and understand the source of their distinctive purchases. Realising that there was nowhere to view hand carving and printing or for people to gain a better understanding of what the craft involved, The Anokhi Museum of Hand Printing was founded by Director, Rachel Bracken-Singh and her husband Pritam Singh in 2005 to act as a platform to introduce visitors to hand printing. 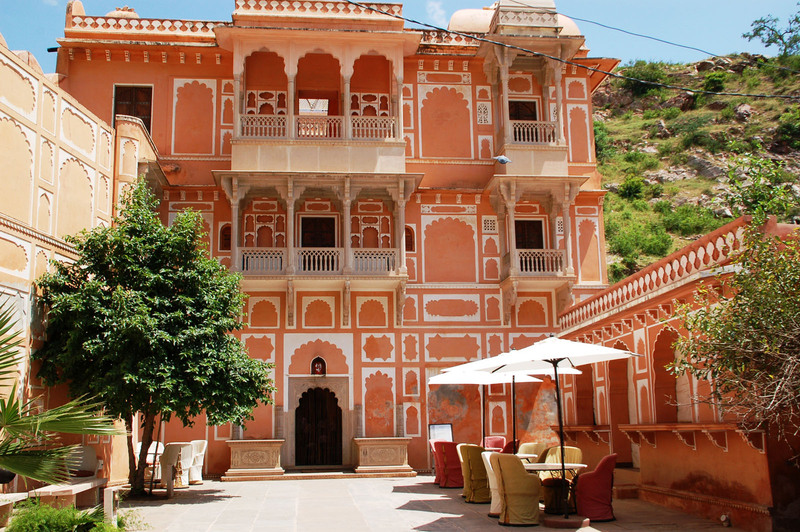 Located in the historic 11th century military town of Amber (Amer) around 13 kms from the bustling hub of Jaipur, the museum is based in the ancient Chanwar Palkiwon ki Haveli (or Chief Fly Whiskers mansion). Purchased as a ruin in the late 1970’s by Anokhi’s founder John Singh, it wasn’t until 1989 that an extensive and sensitive restoration commenced to bring the haveli back to its former glory. A team of specialised craftsmen used local materials and traditional Indian building techniques to reconstruct the haveli stone by stone according to the oral instruction of their elders, a mixing of the innovative and traditional which won the haveli a UNESCO award for cultural heritage in 2000. The grand façade of the carefully restored haveli provides the museum with a spectacular entrance which provokes an eager anticipation to discover what’s inside. Moving through the haveli’s snaking rooms and low doorways, visitors are treated to a broad range of displays which take them on a journey through the craft’s historic roots to today’s more contemporary use of it. Numerous displays carefully explain the roots of various traditional prints while others explain the laborious and intricate processes used to produce each print, further illustrated with hand-on demonstrations from the museums onsite chipper (block carver) and printer. The museum’s collection is in the process of being developed digitally with the aim of providing easier access for the public in the future. The museum’s forward programme is informed by current research around historical work while maintaining a presence of contemporary work by local artists and designers as a way of promoting modern renditions of this traditional craft. 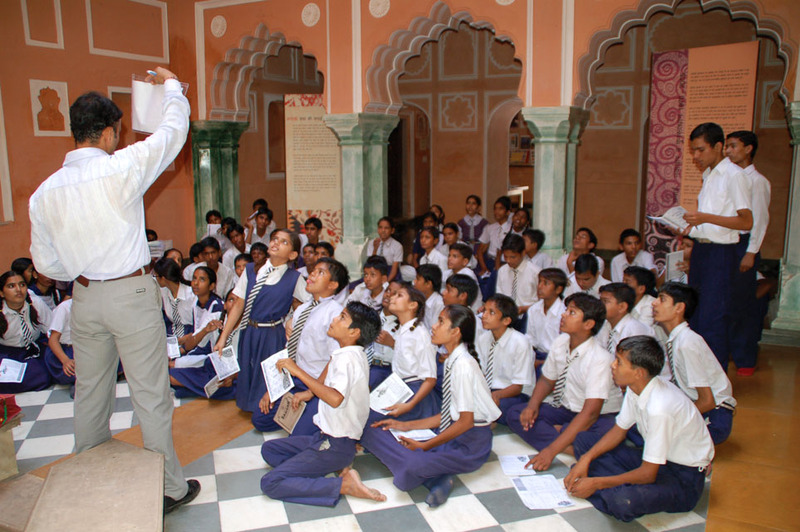 One of Anokhi’s key initiatives, and something which very likely plays a large role in the museum’s success is its ongoing community development programme which encourages the local children of Amber to participate in both the schools programme and weekend workshops, all helping to strengthen the respect the next generation has for this traditional Indian craft. The Anokhi Museum of Hand Printing is a distinctive venue which provides information about an exceptional and very much still active craft. A space of information for a wide range of visitors, from the general public with little or no previous knowledge of the craft to textile enthusiasts and specialists still actively working within the tradition of hand printing; there is something here to enthuse every visitor. Most prevalent perhaps is Anokhi’s sheer dedication to the preservation of hand printing and its active campaign to secure its future, something that will undoubtedly be an inspiration for many other museums with their own specialist crafts to preserve. News of strong growth in the Isle of Man’s visitor economy has been welcomed by Manx National Heritage, which is currently seeing the benefit of increased visitor numbers generated through joint strategic planning and strong partnership working in the visitor sector. Increased visitor numbers to the Island have contributed to strong growth and significantly improved revenues at a number of the Isle of Man’s national heritage sites, which attracted almost 320,000 visits in 2013. “Despite challenging conditions in the UK economy, we have seen strong growth in key areas of our operations. Visits from core audiences such as members of the National Trust have increased substantially. Our sites have attracted almost 16,000 National Trust visits, 33% above last year’s visits from this audience between January and August. Similarly, we have seen strong growth in the Group Travel Market, which generated a 7% increase in visitor numbers and 16.5% increase in revenue during the 2013 visitor season when compared with the previous year. The achievements are a reflection of strong partnership working across Government and a cross section of private sector businesses, together with a significant amount of strategic planning”. During 2014, Manx National Heritage have undertaken a broad number of initiatives to attract both local and international audiences. These have included actions such as preparing an Audience Development Plan for the Island’s national heritage attractions. The plan identifies ways in which Manx National Heritage will attract visits from both new and existing audiences through developments such as the launch of family friendly activities, exhibitions and public events. This sits alongside a busy programme of gallery redisplays and investing in maintaining our physical heritage assets. And we have continued to target the group travel market following continuing year on year growth since our campaign began back in 2009/10. Recent investment at Rushen Abbey to make the site more attractive to the family audience has generated a 33% increase in visitor numbers to the site, whilst projects such as the launch of Celtic Style exhibition celebrating the 150th anniversary of the birth of Archibald Knox has helped generate a 35% increase in visitor numbers and 21% increase in retail revenue at the House of Manannan and a refurbishment of the Manx Museum Shop helping to generate 16% increase in retail revenue. “Moving forward, Manx National Heritage aims to build on its achievements, increasing visitor numbers and revenue from both local and international audiences. We will continue to work on developing activities to encourage visits from the local family audience, whilst also working towards refreshing our offering and maintaining properties in our care. Over the next year, the world famous Laxey Wheel will receive a new coat of paint; the Grove Museum in Ramsey will have roof repairs and the Nautical Museum in Castletown will receive much needed attention. Alongside this, we will continue to support the visitor economy through partnership working and attending trade events such as Best of Britain and Ireland and the World Travel Market with industry partners to place the Isle of Man on a global stage. We will also provide a lively and dynamic programme of exhibitions and events to attract new and existing audiences, whilst also continuing to extend the visitor season”. 2014 was my third visit to the MA Conference, an event which always has a great buzz and welcomes people from all over the world. This year its theme was ‘Museums Change Lives’: usually this topic would simply whet my appetite for the talks, workshops and seminars on offer – but this year it also made me nervous, as for the first time I had to take to the stage and share my ideas with the world. As I mentioned previously, I had to pitch an innovative idea to the ‘Dragons’ Den’, a group of five senior professionals playing the ‘Alan Sugars’ to five nervous apprentices (or am I mixing my reality TV shows?) The purpose was to give us the chance to either develop a new project, or to help an existing one to become more resilient. This year, most of the applicants had a learning background, but our pitches still had to be steered towards business resilience. We had five minutes and a handful of PowerPoint slides in which to explain our projects and ‘pitch’ for the Gold Award: £1000-worth of consultant time. Shakespeare Birthplace Trust’s Elizabeth Dollimore opened with a great pitch aimed at getting more museums involved in Shakespeare Week. Then Annie Sommazzi 8th in the East enthused us all with her idea for a ground-breaking project to combat racism, followed by Rachel MacFarlane of Colchester and Ipswich Museums sharing her plans to involve students in museum interpretation. Caroline Bray challenged the Dragons to help get museum directors and senior management teams to support the delivery of Arts Award – and then it was my turn. I began by quoting CNN’s 2013 article Why I Hate Museums: ‘The main thing you learn in museums, it seems, is how not to run a museum.’ Their grievance with museums is that they are really bad at engaging adults in fun and interactive ways. I then pointed out that, as a sector, we’re really good at helping children enjoy their visits to museums (using quizzes, costumes, handling objects, games – and more! ), but that we haven’t yet extended this to the way we approach interpretation for adults. My idea was to use the Wordsworth Trust’s collection to pilot an exhibition display which included lots of interactive interpretation – but not just for children. It would give adults the change to learn through doing rather than looking, and would be a relatively inexpensive way of trialling this style of interpretation. My heart was racing as I realised I had, in one fell swoop, criticised the entire museums sector, in front of a room full of people who love and work in museums – but I couldn’t go back and had to sit down and wait for the Dragons’ verdict. Thanks to the Arts Council England who funded my travel to the conference through the Wordsworth Trust’s MPM grant, as part of the Cumbria Museums Consortium.